SPCA New Zealand is it still the same old trusted name ? There is an old Hatchet that has been in our family for many years , it has been handed down from father to son and has served loyally each generation . The head was sharpened a few times and then the handle broke so it had a new handle , then the head was beyond sharpening and it got a new head , I think it has had five new Handel now and three new heads. 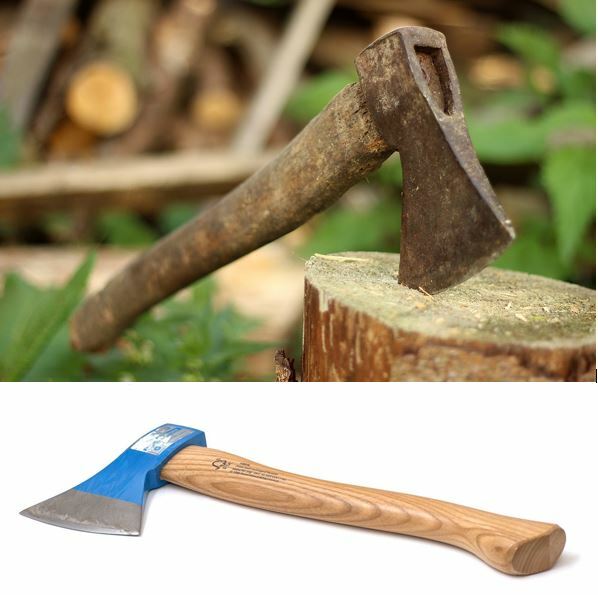 But its still the same old trusty Hatchet.. despite the fact that the handle is now varnished and the head is blue . A Society for the Prevention of Cruelty to Animals (SPCA) is a common name for non-profit animal welfare organizations around the world. The oldest SPCA organization is the RSPCA, which was founded in England in 1824. SPCA organizations operate independently of each other and campaign for animal welfare, assist in the prevention of cruelty to animals cases, rehabilitation and finding homes for maltreated and unwanted animals that can be reestablished into new homes. Policies regarding animal euthanasia, handling feral cats, and similar issues vary by organization. (iv) Any other ways and means as the Royal Society may deem appropriate. e. act as an Approved Organisation under the Animal Welfare Act 1999, including taking action against those who fail to comply with their legal obligations relating to the physical, health, and behavioural needs of Animals. A new CEO is being recruited Final Position Description CEO SPCA to do the dirty work of transitioning from a society which exists to prevent cruelty to animals to one which rely on animals suffering for an income stream. To me this appears to be a juxtaposition , as the stated aim of “act as an Approved Organisation under the Animal Welfare Act 1999, including taking action against those who fail to comply with their legal obligations relating to the physical, health, and behavioural needs of Animals” cannot occur unless animals are harmed and since there is a financial benefit in enforcing the act the SPCA may no longer act to PREVENT cruelty as from an accountants point of view the $$$ occurs when animals are harmed. Mr Trainer is an accountant, ex Ernest and Young , is he going to spend some of the 25 million on educating people and prevention methods or is he going to make $$$ for the society by prosecution ? What would an accountant do ???? I have to wonder why Andrea Midgen wore two hats for this time, was it because her two hats suited this part of the transition , despite it being a gross conflict of interest, why not advertise for an independent CEO 10 months ago ??? ?All too contrived my my sense of comfort. So if you are the applicant for the position of the new CEO responding to this email please be aware that you will be assisting in the destruction of what was once a trusty old society . Following the strong vote in favour of the One SPCA entity at the AGM on Saturday 17 June, the Board has decided to initiate the process for the recruitment of a permanent CEO for the RNZSPCA. As you are aware Andrea Midgen has been ‘double-hatting’ for the past 10 months as both the CEO of Auckland SPCA and the Acting CEO of RNZSPCA. The CEO of RNZSPCA is probably the most critical role in our new structure and it would be highly advantageous to have a confirmed CEO in the role during the months leading up to “Day 1” (1 November 2017) to ensure strong and focused leadership during the transition phase to One SPCA. We have made a decision that, in the first instance, we will open this role to applications from internal candidates only, i.e. employees within the SPCAs across the country. If we are unable to find a suitable candidate from amongst our ranks we will then go to the wider external market. – A collaborative working style with a track record of building effective relationships. We have asked Kira Schaffler as the Project Manager for the One SPCA project to coordinate the initial steps of the internal recruitment process. Kira has extensive experience in the recruitment and appointment of executives and will provide a strictly confidential coordination point for initial applications. Please forward this email to your staff and volunteers in your Centres. It’s important that all employees are kept informed about the recruitment process for this key leadership role in our future SPCA. If you have any queries about the process please contact Kira Schaffler on 021 924 845 or kira.schaffler@spca.nz who will be able to answer your questions on a strictly confidential basis. I am a member of the Hawkes bay branch of the RNZSPCA , That branch is one of the many members which make up the RNZSPCA. Recently I attended a meeting of Taupo residents and Taupo branch members who were concerned about being disenfranchised from their society . It appears that there is a group of people who have taken upon themselves to promote the one SPCA concept but have manipulated the branches and member societies in such a way as to ensure that their objective of disestablishing the smaller society and taking their assets is achieved. Andrea Midgen has now filed a new constitution which was allegedly passed last week in circumstances which stretch the concept of democracy as delegates for at least 15 societies had no mandate from the members who they purported to represent . I note that in particular they wish to provide a better life for animals .. this probably needs to be read in conjunction with this you tube recording which demonstrates the wastage of donated charitable funds. Providing a better life could include buying a better car for the owner of the animal something which according to this recording has happened in the past . educate New Zealanders about their Animal welfare responsibilities , they are currently euthanizing more animals than ever before , they are spending more on human resources and corporate wages particularly looking at getting the inspectorate going and prosecuting more new Zealanders. so is education going to be through prosecution ? It has to be of note that it is the SPCA and not the RNZSPCA who have the team of lawyers on board . act as an Approved Organisation under the Animal Welfare Act 1999, The government has responsibilities for animal welfare this is primarily performed through the MPI and the police . 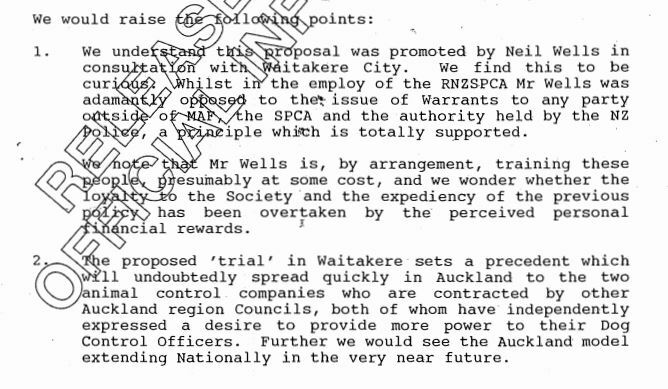 A former RNZPSCA president , Neil Wells ,who was also a barrister wrote the bill for animal welfare act and was Independent adviser to the select committee and did not declare his conflict of interest when he included the provisions for the concept of Approved organisations. The persons who have been behind this drive for the SPCA to develop the inspectorate just happen to former MPI inspectors . this whole concept is not about being a charity but about starting a law enforcement group using the 25 million or so ,this has been side lined into trusts. These funds which were given to the SPCA have been deprived from the true beneficiaries , the animals. there appears to be a massive misappropriation of charitable funds because people dont realize that the SPCA has been hijacked. q. be a member of, affiliate or be associated in any other way with, any organisation which has objects which are similar, in whole or in part, to the Purposes of SPCA; and. (d) To generally do all such acts and things as shall or may be for the benefit of Branches or Member Societies or in the interests of animals and their welfare. there is a gross conflict of interest between the Auckland SPCA and the RNZSPCA . there has been a historical fight for power , it now appears to me , that the Auckland SPCA which has posed as the SPCA see here has succeeded in taking control of money and is now taking over the RNZSPCA and will pass that control through to itself by virtue of this new constitution . 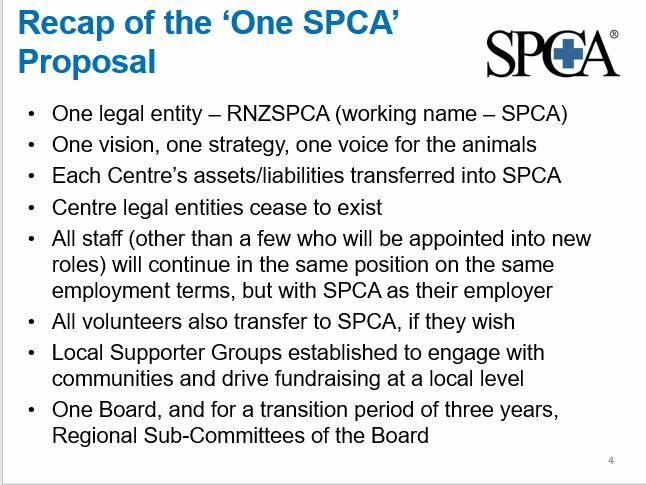 Constitutions for branches taken into administration , (for which there is no legal provision) , have been unlawfully filed to ensure that the latest constitutions state that on winding up or dissolution the assets go to the RNZSPCA. I have been told that well over 2 million dollars of charitable funds have been used for this restructuring. Money which could have been put to good use by saving branches which have been closed down by people other than the members. the emphasis is on the inspectorate and it is not coincidental that Mr Wells who wrote the legislation also set up the training program at Unitec for inspectors, so by becoming inspector focused there is a financial spin off for others but what has been forgotten is that before a prosecution can occur an animal has to suffer . so the society for prevention of cruelty no longer fulfills its traditional role having instead become an enforcement agency and therefore by definition is no longer a charity . I have posted this on transparency in the interest of transparency . All of the above are deemed by the Legal persons in their own right and the sole control of each is by its respective members . An incorporated society must have at least 15 members , the members file their constitution and run their society according to the constitution. Often farmer brown gave a corner paddock and the local trades men go together and constructed a premises for the volunteers to work out of . The societies were names the “what ever” society for prevention of cruelty to animals, the assets came from the community and were for the benefit of that community . Each society acted independently until a federation was formed which lent a common voice and support structure to all . 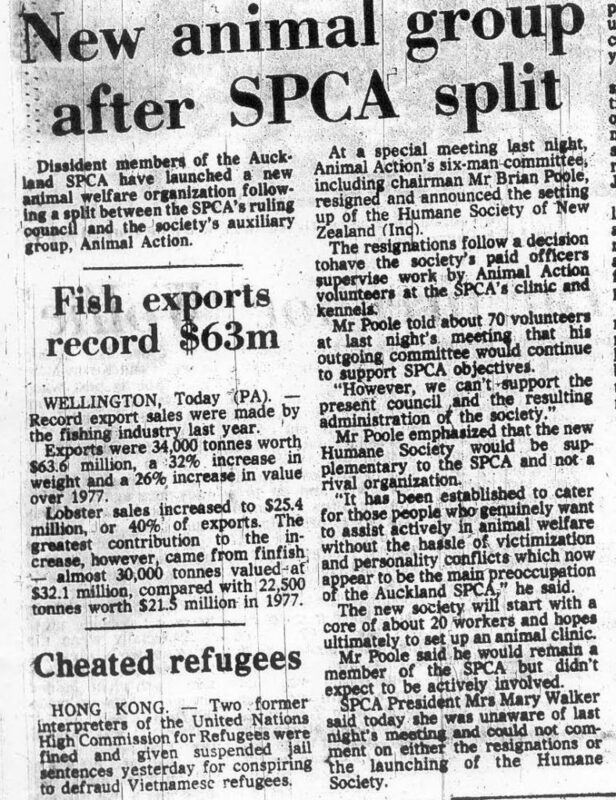 The federation disappeared and the RNZSPCA became the national body effectively having one representative from each of the member societies. Persons posing as officers of these societies did so without any mandate from the members , they effectively took over the assets of that society and dealt with them as though they had a right to do so. In some instances property including real estate was sold , there is no evidence as to where the funds went . There is no provision in law which would support this action and in reality I believe that these persons are committing fraud by holding themselves out as having legitimacy over the asserts and running of the societies they have taken over. These persons who include the following have had absolutely no legal right to act in the manner which they have yet have bamboozled volunteers and members alike , taking advantage of the fact that most ordinary citizens don’t know that the people from the so called Head office who they trust were actually setting them up to take over their society and asset strip the local community . It has to be remembered that the” P” stands for prevention not for prosecution and by the time prosecution occurs the animal has already suffered . so essentially the SPCA is no longer functioning as the society it was set up for and instead being a society which relies on animal abuse for its existence. an article on the dangers of the SPCA inspectorate is https://www.spectator.co.uk/2013/02/off-the-leash/# Does the RSPCA think it’s the FBI? Dozens of ordinary householders have been convicted, fined and even tagged for offences such as killing squirrels in their gardens, or not arranging adequate veterinary care for a sick pet. Those animal owners who fall foul of the RSPCA include the elderly, sick, bewildered or poor. Some of the prosecutions have been little short of farcical. Householders who kill garden pests have been convicted on the basis that the only humane way to dispatch a squirrel is to take it to the vets for a £70 lethal injection. Worse, there is a growing suspicion that not all RSPCA evidence of cruelty is what it seems. Wake up NZ we need to educate people and care for the animals . Those taking control are lawyers and accountants it is a power game and more animals than ever will be put down and caring owners will be the target of prosecutions. If you do nothing then you are part of the problem , Please help prevent cruelty not make cruelty the aim of financial gain. SPCA AOTEAROA LIMITED is this the monopoly model for the SPCA ? You can help by speaking out please do not remain silent on this one ! The company is allegedly owned by The Society for the Prevention of Cruelty to Animals Auckland Incorporated but despite the fact that it was incorporated 30 June 2014 no mention of this company can be found in the annual reports 2015 annual report or the 2016 annual report. 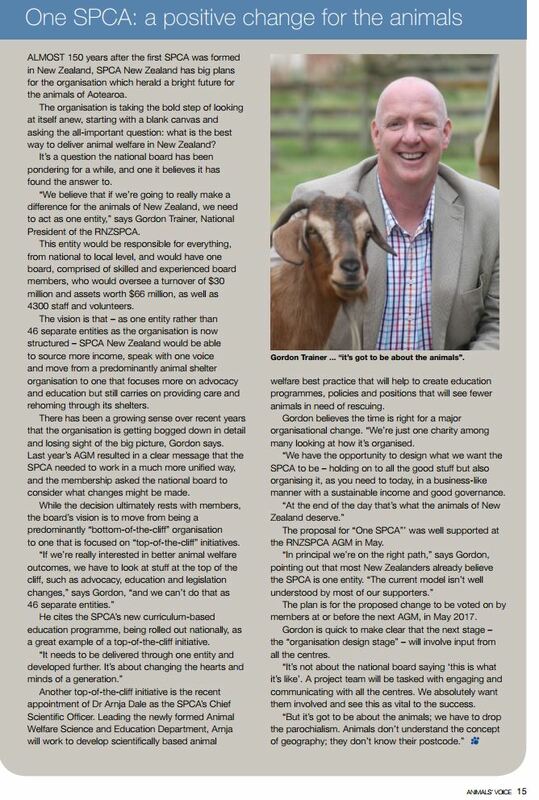 Gordon trainer was co opted to the national board September 2015 and it would appear on what I can see , that he became president when he had already set the wheels for SPCA aotearoa in motion . There are some 40 incorporated societies which are members or branches of the RNZSPCA , The RNZSPCA is the national body on which all of the individual branches and member societies have a representation . Those persons who are the appointed members to the RNZSPCA then select their office bearers from their number. But what so often happens is that one person becomes entrenched in the role and that is where the propensity for going off the rails occurs. 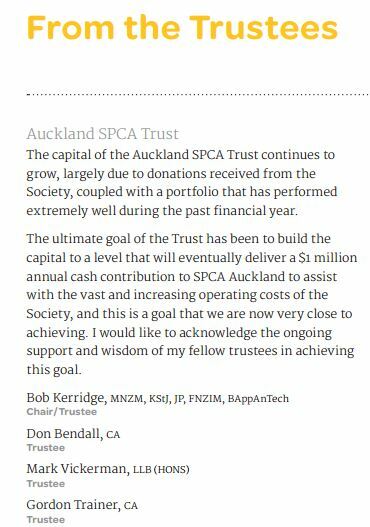 For many years Bob Kerridge has been both the chairman of the Auckland SPCA and the national president of the RNZSPCA , he was followed by Gordon Trainer. Now the SPCA Auckland would be the first one to admit that throughout the country there is much confusion about the number of SPCA’s many think there is only one. The reality is that the Auckland SPCA is the equivalent status of any of the branches, it is a member society which just happens to hold the reins through its chair man. this is simply achieved by leaving the real name off by dropping the word Auckland. This particular example was signed By Andrea Midgen who is now travelling the country and telling societies that once amalgamation takes place they will have to change their names if they are not part of the one SPCA. This means that the funds can also go to Community Cat Coalition Incorporated or New Zealand Companion Animal Council Incorporated but apparently it does not go to RNZSPCA branches which have felt the financial burden of having a paid employee thrust upon them by the national body . Financial hardship is one way of making groups change their view on autonomy and by creating financial pressures on a society control can be gained. 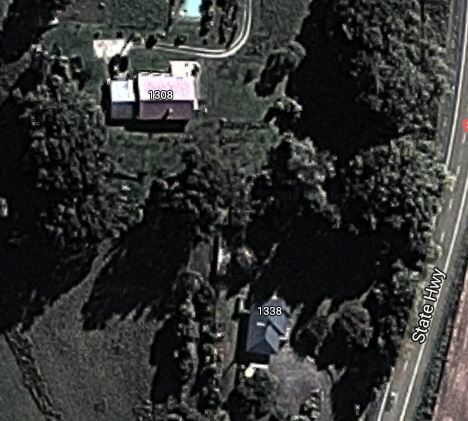 the Te Awamutu Branch reportedly was wound up in this manner and Waikato closed its doors despite that fact the $400,000 appears to have shifted sideways from a trust where the RNZSPCA branch was once a trustee . So the whole one SPCA thing looks very much as a being contrived and driven by The SPCA, Millions of dollars which shoul dhave gone to animal s have gone on corporate wages fro this restructuring. In the New Year, I met the Chairman and the Board of the SPCA Auckland and gave a presentation that included a proposal to take charge of developing an initiative I believed would save the organisation money and further its goals. The Board appointed me as a Director in early 2009, and, shortly after, I implemented the strategy which is now known as the Pro Bono Panel of Prosecutors for the SPCA Auckland. Note that this is only For Auckland. The organisation known as the Royal New Zealand Society for the Prevention of Cruelty to Animals, Incorporated is an approved organisation for the purposes of this Act. Rumour has it that the one SPCA is all about developing the inspectorate and apparently also about giving work to a lot of well meaning lawyers who have been sold half a story . What the author points out about strict liability offences is a very serious point. In a strict liability offence the Inspector only needs to think that your limping Moggie needs to have gone to the vet and you could well be up for a massive fine . Run with a team of lawyers and over zealous inspectors no animal owner will be safe and I fear that more animals than ever will be put down . It will be a licence to print money by the monopoly which appears to be being set up by bullying the volunteers who have been the very fabric of society out to set up their own organisations in their area but will live in fear of being be wound up by the inspectors of the mighty monopoly. The SPCA will be the only private law enforcement authority . I know the problems well I saw it with AWINZ. There is nothing open and transparent about this Take over , it is contrived, manipulated and deceitful . There is no ability for whole societies to be taken over by a group of people and those who are posing as members of a society taken over by stealth should be held accountable to the full extent of the law , they have no legal right to file constitutions on behalf of the members and run up financial burdens for the society , each should be personally responsible.. Isn’t that what Andrea Midgen said ? So why should she not be responsible for the actions on the half dozen or so incorporated societies she claims to have rights over when there is no mandate from members. The SPCA is being corporatised , its going to be big business , it will kill volunteering, community groups and will make animal lovers live in fear of persecution . the funds which have been given to local communities to set up shelters will be liquidated into corporate wages for accountants lawyers and consultants . This is of national importance and I certainly hope that there will be a public investigation into this as to me it appears that there is a gross misappropriation of charitable funds . I also hope that the charities commission will remove the charitable status of an organisation so apparently driven for profit. 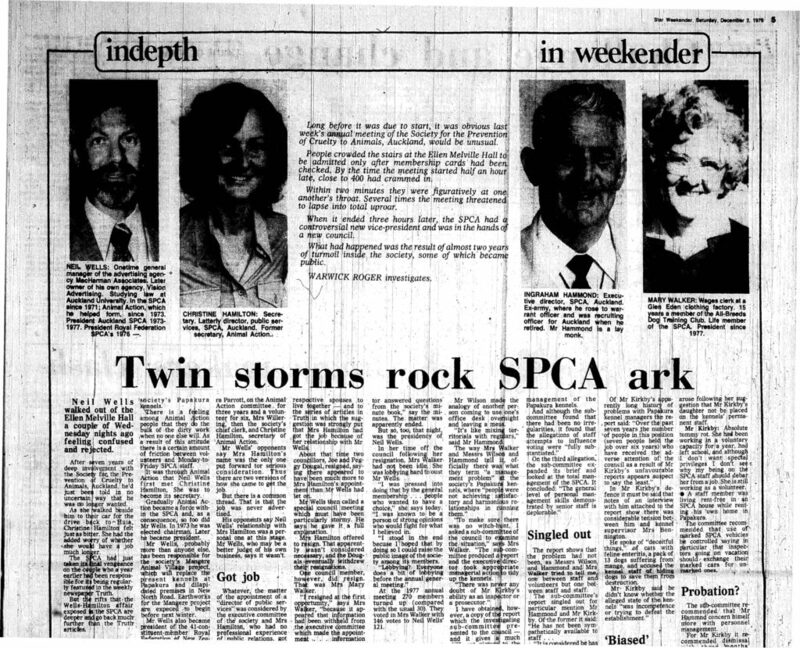 I have already covered off the in fighting in the late 70’s and the fact that the law enforcement powers of the inspectorate was only given the the RNZSPCA and speculation has been that the SPCA, a member society has always wanted to take over the RNZSPCA . From what I have seen in this last week that appears to be very much the case. The legal name of the Auckland member society is The society for the prevention of cruelty to animals Auckland yet you refer to yourselves as . On Thursday night I attended a meeting and was confused when I heard that you would be there as you are the CEO of a member society of the RNZSPCA and without providing any evidence as to your lawful appointment as acting CEO of the RNZSPCA, you addressed a group of Taupo people about the RNZSPCA amalgamating into one. I suspect the reality is that this about the SPCA taking over the RNZSPCA and its member societies and branches. The locals who attended expressed concerns that despite the fact that a number of them had been volunteers at the SPCA they had been denied the opportunity to become members and had been told that no new members were being accepted until after the one SPCA vote had been taken. It appears that the person in charge of the Taupo SPCA and in control of the membership list is One Geoffrey Sutton who is actually a paid employee of the RNZSPCA . I also noted that you had become an alleged officer of the Taupo SPCA by the filing of a document just days before the meeting claiming that you had been an officer of the Taupo society since September 2016. The method of your appointment is to say the least dubious as we were discovered that the society had not had a meeting of members in three years so I have to question how you could possible have a mandate from the members . The unique thing about incorporated societies is that the members are always in control of their society yet it appears that the RNZSPCA and the SPCA have taken over the governance and control of various societies without any formal mandate to do so . I also note that Jennifer Temple , project and change Co ordinator mentioned here is also actually an employee of SPCA . so my question is who is driving this One SPCA ? On 5 September 2016 you not only became a Officer of the Taupo SPCA but also the Thames , Wairarapa, Te kuiti, central King country branches and on 23 January 2017 the Waikato branch. This may require some explanation and you may have to provide a legal basis for these appointments as there certainly does not appear to be any provision under the Incorporated societies act which would have allowed for such an event. I also need to point out that the constitutions which you appear to rely on generally appear to have been filed with the registrar by means other than the formal requirement of being accepted by a AGM and the process of filing these constitutions may actually be in breach of the act and you and your associates may be committing fraud by pretending that you have the lawful capacity to file these documents. It was pointed out at the meeting that The Taupo branch Operated in a positive financial manner until the RNZSPCA ” placed the branch into administration ” Since then the number of staff have increased and the results have dropped back and losses occurred. I am personally aware that such tactics have been used on societies which have been wound up and when they were wound up they were not wound up by the members, but by the persons who posed as members and arranged for the assets to be taken out of the district in which they were gifted and used for SPCA functions else where. This brings me on to the “poverty “which the SPCA pleads this does not take into account the 25 million in The Auckland SPCA Trust. While small SPCA’s struggle on this massive pot of money is increasing annually should some one not see where this money comes from, are these bequests which are being made from all over the country and ending up in the coffers of this trust which appears not to share. Given the confusion that you yourself have introduced in the companies register as shown above it is of no surprise that the general public and the lawyers and trustees of bequests are also confused. Geoff has now called a SGM to give a perception of legitimacy to the resolution to become one SPCA yet in three years has not called an AGM and has actually been obstructive in allowing members to contact each other so that the members themselves could arrange for an AGM and elect a new committee. 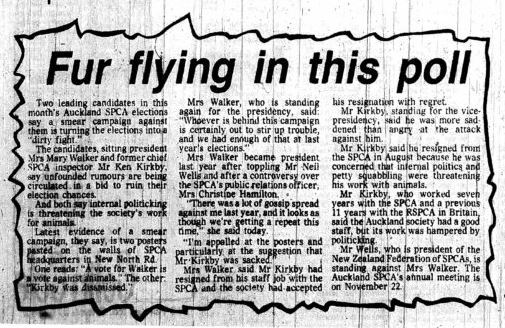 It appears that with all these high flyers involved that the SPCA is actually the entity taking over the RNZSPCA branches and its member societies . I personally believe that this is to expand the Inspectorate and enforce the strict liability offences under the act. It will be licence to print money . Every constable is, by virtue of his or her office, deemed to be an inspector appointed to act generally throughout New Zealand for the general purposes of this Act. It appears to me that this is all about money, the involvement of former Ernst and young Tax accountants and their lawyer friends prove this to me and from a personal perspective I am concerned that funds that have been given to a local SPCA’s for animal welfare in the area are being misappropriated for uses other than for which it was donated. I therefore believe that this is not about animal this is about power and control . On the other hand the local branches are being lumbered with financial obligations by the RNZSPCA such as the wages of the likes of Geoff Sutton and work which was previously done by Volunteers. Waikato has had a trust which had the Waikato branch as a trustee, it was later removed and that trust has been struck off and presumably transferred its funds to a similarly named trust see THE WAIKATO SPCA TRUST and SPCA WAIKATO TRUST BOARD some where in this transaction some $400,000 has been whisked away from the branch see There is profit in animals .. or why is the RNZSPCA restructuring and what is Neil Wells connection. and The Waikato SPCA is being forced to close as it struggles with financial woes. I think it is time for a massive audit before you start winding up smaller entities due to financial pressures. As the person who is fronting this ” amalgamation ” I am asking you Andrea to make certain that it is all above board. There is no rush, by creating urgency you could be the whole country up for one massive financial scam. I will be happy to publish any explanation you give. The future of animal welfare in New Zealand hinges on your integrity will you do the right thing ? Undertaking a constitutional reform of the SPCA as National President of the Royal New Zealand SPCA by drawing 45 independent SPCAs into a national society, and as National Director by establishing the first National Office in Auckland. this was just prior to drafting the animal welfare act and in the act provided only for the RNZSPCA to have the ability to employ inspectors . His intent appeared to be that he would be training the inspectors and thus have control over enforcement and provide himself with $$$$ . Over the past few years he has been amalgamating SPCAs and when he became chair man of te Kuiti he set about changing the name of the SPCA see The significance of a name change Te Kuiti RNZSPCA or King Country SPCA. 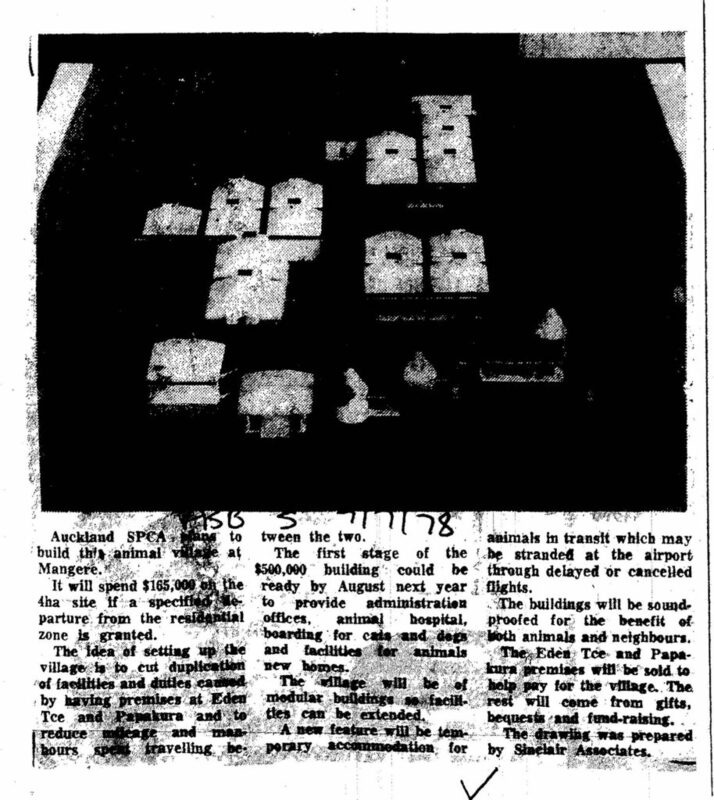 In the brief time that Wells was chairman of the Te Kuiti SPCA he purchased a building . this property has now been sold at an apparent loss . Why is it so dangerous for the spca to have control. Look at the legislation which Neil wells advised on and drafted. (1)In a prosecution for an offence against section 12, it is not necessary for the prosecution to prove that the defendant intended to commit an offence. (1A)In a prosecution for an offence against section 12 committed after the commencement of this subsection, evidence that a relevant code of welfare was in existence at the time of the alleged offence and that a relevant minimum standard established by that code was not complied with is rebuttable evidence that the person charged with the offence failed to comply with, or contravened, the provision of this Act to which the offence relates. (c)that there was in existence at the time of the alleged offence a relevant code of welfare and that the minimum standards established by the code of welfare were in all respects equalled or exceeded. (iii)where the defendant intends to rely on subsection (2)(c), the relevant code of welfare that was in existence at the time of the alleged offence, and the facts that show that the minimum standards established by that code of welfare were in all respects equalled or exceeded. Section 13(1A): inserted, on 19 December 2002, by section 4 of the Animal Welfare Amendment Act 2002 (2002 No 53). from the events of this last week and of the past 11 years I can see a trend emerging. Neil Wells Good ..Grace Haden Bad. By smearing a person and throwing a lot of mud there is the hope that some of it will stick and people do tend to say where there is smoke there is fire , well sometimes the apparition of the fire is actually a smoke screen. Mud slinging can only be addresses with truth and facts and so often the person doing he slinging does so to keep the focus off himself. To look at what Mr Wells has been involved in we need to look at the trusts which he has operated with total disregard of the law. Interestingly enough the bank account at the national bank mount Albert only had one signatory and had no trust deed associated with it. the one signatory was Neil Wells. He assures the secretary that ” Any funds from The Lord Dowding Fund would be kept as a special trust fund within AWINZ to be applied according to the original tenets of the Fund.” Signed By Neil Wells Trustee . The reality is that AWINZ had no legal existence it did not have trustees and it did not operate as a trust it was like The fund for humane research something Neil Wells took upon himself to call a trust . as mentioned earlier the Lord Dowding fund was used to sue me the charities records show how the sum has changed over the years from 98,000 to 22,000 yet Neil wells has some how made a personal profit of 57,000 and not repaid the money he used to sue me . the interesting thing is that the trust which obtains the money doesn’t legally exist and there are so many holes in this trust structure that a truck would fall through. The origins of AWINZ . Neil Wells after leaving the world society quits in a row over the kaimanawa horses see the decision here and sets up shop as solicitor sole, I suspect that he found business slow and approaches Waitakere city council to work on a project to amalgamate dog and stock control with animal welfare . In the defamation hearing in 2007 Neil wells falsely claimed that the council had approached him with regards to amalgamating the two functions but the documents I have clearly prove that he misled the court on this point ( and many others ) I call it perjury . 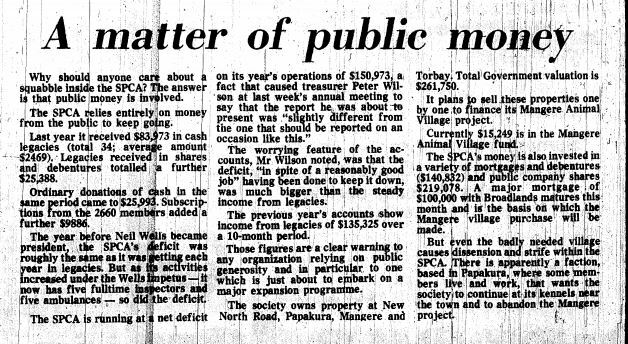 IN 1994 he approaches the Waitakere city council with his idea of combining animal welfare and animal control and suggests to the council that they could set up an SPCA type organisation. Neil Wells has taken some initiatives with respect to enhancing our animal welfare services by proposing the establishment of a pilot programme whereby our staff fulfill the role of animal welfare inspectors by providing an SPCA type operation. In a parallel move Wells promotes himself as a ” consultant for Waitakere city council ” To Maf David Bayvel who he knows well and has already done groundwork with . By august that 95 council officers were appointed as Inspectors . Neil Wells then lobby’s councils up and down the country to encourage them to consider his proposal this is a sample letter he does this using a very impressive letter head which is just a pseudonym for himself . The No 1 bill is rejected as it infringes on the bill of rights , the powers which wells was seeking for the inspectors appear to be draconian and so A second bill is introduced and the two bills are integrated into one, Neil Wells is taken on as the ” independent adviser to the select committee . He does this without declaring his conflict of interest. animal welfare decided that it would be more effective and efficient to consider the two bills together, and delayed consideration of the Hodgson bill in order to do this. In early 1998 Wells promotes the concept of a trust and suggests that the council be involved and provides a flow of funds diagram he appears to make this move to circumvent the intention of the legislation following the introduction of the second bill. 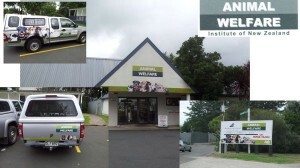 Animal Welfare Institute of New Zealand (AWINZ). AWINZ could be that national body and would be responsible to MAF Reg through a memorandum of understanding or contract. ….It is possibly premature to propose Part 2 at this stage as there needs to be a little more certainty in terms of what is in the Bill, when will AWINZ be up and running, what transitional procedures can be used for Waitakere City. He gets Didovich to gather people the criteria being that they should be well know to give the trust ” credibility ” and so some people are called together and Wells is paid for their meeting. You may have noted that crucial events take place at christmas time this is a very good tactic as things get rushed through or overlooked. This week the RNZSPCA will vote on amalgamating the branches and the member societies into one organisation . It is a foregone conclusion fed by misinformation and stealth in taking over branches on the false presence that the branches are obliged to comply with the directive of the RNZSPCA . What has to be remembered is that each branch , each member society is a firstly a legal person in their own right and secondly affiliated to another group of their choosing . The only persons in charge of an incorporated society are its members. It also has to be recognised that there is a distinct difference between the RNZSPCA and the SPCA . 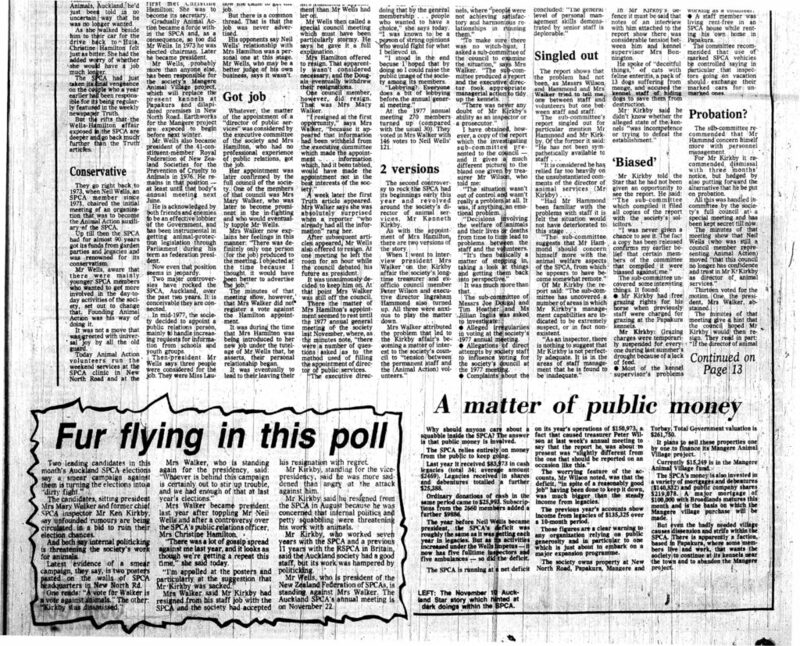 During this time Neil Wells was still the president of the Royal new Zealand federation here he is signing the rule changes for the royal federation this is filed on the THE ROYAL NEW ZEALAND SOCIETY FOR THE PREVENTION OF CRUELTY TO ANIMALS INCORPORATED document page suggesting that he federation may have had a name change in 1981 when Wells again signs the documents. 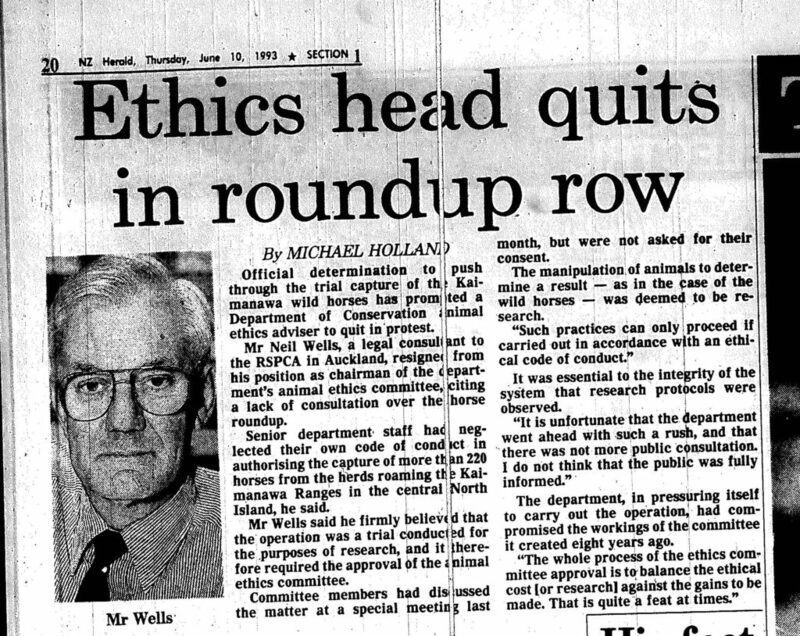 1989 finds him in the office of the world society for protection of animals and in 1993 Wells resigns after another row as head of ethics and sets up as barrister sole . Wells is well connected to government through his former business partner Bob Harvey, Harvey is now the Mayor of Waitakere city council and later as president of the labour party Bob seemingly facilitates AWINZ in being granted law enforcement status . Is Transparency New Zealand supporting the perception or being serious about corruption . Recently I applied to join Transparency International ( again) the new Zealand branch of Transparency International appears to be at odds with the rest of the movement and I have again been rejected . I found the declaration after visiting the Unmask the corrupt pages by Transparency international . It would appear that internationally we are exposing corruption but Transparency International New Zealand feels uncomfortable even with acknowledging that there is such a thing as corruption in New Zealand. The events of last week have driven it home to me just how corrupt we are and how unseen cowards can pull strings in the background to ensure that whistle blowers are dealt to . A small Probono job in 2006 saw my life change and 11 years later I am still suffering the fall out, that is because I stumbled on corruption which is being actively concealed by the National government and the last Labour government . The man involved is a labour man an animal welfare lawyer who wrote legislation for his own business plan, advised on it as independent adviser to the select committee and made what I know to be , a fraudulent application to the crown for law enforcement for a fictional organisation which in reality was just him. He ran his “ approved organisation “ from Waitakere city council premises where he was manager . He used the staff, infrastructure and vehicles to run his operation and re branded the building to give it the same appearance as the fictional “ organisation” which had the extensive law enforcement powers of search seizure and prosecution. The logo top right was that of his fictional organisation the buildings are the dog Pound at the then Waitakere city council where he was the manager. When I asked questions of council and MAF I was sued by him for defamation , I was denied the statutory defence of truth and honest opinion for stating that the trust AWINZ could not have made an application in 1999 as it did not exist at that time and was only created in 2006 to effect a cover up to conceal this in court . He had about a dozen attempts at bankruptcy and even put my company into liquidation using a false affidavit . The liquidation was reversed ( by court order ) and I fought off bankruptcy. there were no concerns about my health and well being I was severely depressed dam near suicidal and the attacks kept coming . But as they say what doesn’t kill you makes you stronger so it woudl appear that this sick old man has come back for a second attack on me because he is so fearful that he will be found out . Apparently standing up for your rights is being called litigious . But guess that sounds better than saying I fought for .. justice . which is a silly fight as I do not believe there is any in NZ. Questioning the lack of existence of AWINZ has devastated my life and torn my family apart. I moved to Napier thinking it was all over and hoped that one day the barrister would be found out. Next thing my private investigators licence cames up for its 5yr renewal and is declined because the “authority” thinks that the opinion of a police woman, who spoke to me on the phone in 2012, matters and calls me a conspiracy theorist on that basis. This is such an important issue that when I appeal the declinature of my Private investigators licence it makes headlines in the news. At last I saw him for what I know him to be and in a blog , exercising my right to freedom of expression and right to hold an opinion. I expressed my opinion as to the identity of this person. I am aware that suppression in the lawyers and conveyancers act is given by not releasing his name , hence he was called mr M I was not part of the process and did not know that he had been before the tribunal I just knew of the circumstances outlined in the news item, in fact I had known since 2006 that he was attempting to get his hands on the funds of this dear old lady and even had correspondence relating to this. Two weeks after my publication I was charged , No one has been able to provide me with a “ order “ for suppression and the police charge is ambiguous using wording for one alleged offence and the statutory basis of another . I was provided with an almost totally redacted document when the full version is publicly available on line . I did note that Fear appears to be plaguing Mr M states at 26 the practitioner has in the past been pursued by a litigious and irrational person who might be expected to re-engage in a campaign against the practitioner should the present matters come to that person’s attention. And then puts the boot in stating “ The litigation pursued by this person has been the subject of adverse judicial comment at all levels.”( yes prompted by his lawyers who never checked the facts and were good at attacking character but lousy at identifying facts ) see Is the AWINZ Charity complicit in fraud on the courts ? So again I am made out to be this less than desirable person and despite the fact that this lawyer has now committed what appears to be a criminal act he gets his identity withheld and Is not charged with his serious offences . I go to court the press is there and next day my name age and the fact that I have been charged appears in the local paper, nationally on line and nationally on the radio . Do you spot the irony here I do . I thought you were innocent until proved guilty . If the prosecution guide lines had been followed for me then I would not have been charged . But it is so very important to charge me and publicly execute me before The trial , while Mr M comes out unidentifiable and unscathed. I have to wonder Why am I so important and why do the various ministers that I have written to over the years not care about the use of public office for private gain by the man who got law enforcement powers for a fictional organisation. You need only look at the news item regarding the censured lawyer and you will see that the Lawyers tribunal is effectively condoning theft by a person in a special relationship ( theft by failing to account ) they should have sent this matter to the police for criminal prosecution . If they can condone serious offences such as that why I am being persecuted for exercising my rights under the bill of rights. If this is not “ evidence” of a corrupt society what is ? what are our standards ? Warped I would say . Protect the lawyers crucify whistle blowers only means one thing.. there is a lot more corruption than they like to pretend. This week I had the opportunity to speak to Bill English , I voiced my concerns with regards to corruption and the apparent apathy that those in government service have to it . I can only guess that nothing will happen but will follow up with David Elliott who is standing for Napier . It was Particularly pointed for me this week .A complaint made on 4 May saw me charged with offences less than two week later despite there being no obvious evidence of the order which I allegedly breached and had no access to . Yet in 11 years no one has looked at the fictional law enforcement authority,AWINZ and the way that a charitable trust was used to fund the court action and the apparent fraudulent use of the charity involved . Due to my journey I have become an expert in spotting potential danger spots , my skill was recognized by a former lawyer who took me to court for the act of simply breathing, this was because he was so scared of what I knew about the multitude of companies that he and his wife operated. What I had stumbled on was the equivalent of the panama papers , Latvian directors , Panamanian companies Ukrainian money laundering and arms trade. These events led me to organise a petition for an independent commission against corruption, this was at least 18 months before the Panama papers story broke . Our government knew but did nothing . Andrew Little presented the petition to Parliament where I was the lead petitioner . This was just after the National party took office and it was thrown out by Mike Sabin ( what happened to him ? ) when I produced the evidence in support . see What happened to the petition for a commission against corruption ?. The Press was not there nothing was heard . But hey me being charged now that is news ! 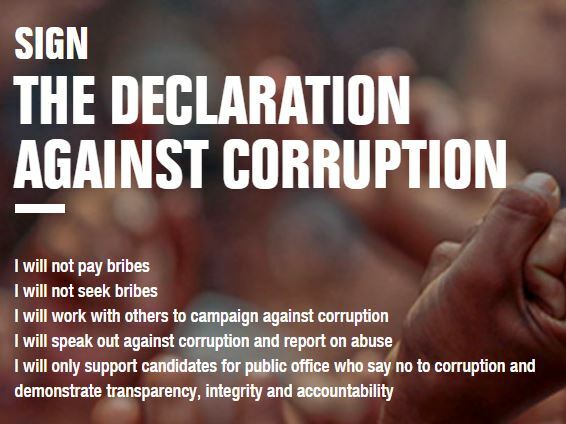 In December 2015 the UN convention against corruption was finally ratified by NZ . We had been a signatory for many years and ratification was a well kept secret and slipped by the news media, I recall the news that day was of some poor vegan gentleman who had found a slug in his fresh pack salad. Todays paper there ws an article by one of our very few investigative journalists on foreign trusts…Officials fear $140m charity tax rort . I noted all the hall marks of potential fraud are there and I have to wonder how these trusts were register as charities in the first place, but then I remind myself its quite easy No one checks . Just like AWINZ the law enforcement authority that did not exist.. no one checked . the Order whihc does not exist yet I am charged with breaching.. no one checked. I would still like to know why an application made on 22 November can be made by a trust which did not exist. The officer details for these trusts are respectively Chasselat Trustee Limited ,Bellerive Trustee Limited, Alpage Trustee Limited, these companies again follow the structure of off share trusts , overseas shareholders and directors and local directors to appease the Law . All three were registered in 2013 , and I have to ask what do the people who rubber stamp these applications check for,or is the process automated ? the directors for the three trustee companies are two Swiss the other three New Zealanders . They are connected to a larger frame work ASIACITI TRUST NEW ZEALAND LTD Graeme Walter BRIGGS together with Taylor and Willis . It is by far easier to have a checking mechanism in place that way people don’t get ripped off or hurt. Had there been simple due diligence done on AWINZ then Neil Wells would not have been able to have committed what appears to be a fraud on the government, one which is too embarrassing to deal with so it is far easier to shoot the messenger and execute the whistle blower. all I want is the the law to work the same way for these crooks and rip off merchants as it does for me expressing an honest opinion and exercising my right under the bill of rights. In the mean time Neil Wells, Tom Didovich, Wyn Hoadley and Graeme Coutts continue to live in fear that one day they will be caught out . Neil Wells is still the only one running the charity which has never done anything but sue me, misappropriate the funds from the lord Dowding fund for Neil’s own enrichment see The Animal Welfare Institute Of New Zealand. It is the governments task to ensure that there is one law for all and it is enforced equally . which party will Help ?